There's a movement back to local food throughout England, partly because many farmers have had to revert to premium food production to turn a profit. The Lake District is no exception to this, and you can find excellent local produce in every corner of the Lakes. We list a variety of the most famous producers below, with recommendations about what to try. We've also published a variety of Cumbrian recipes for your entertainment - ranging from traditional Cumbrian foods such as Mint Cake, Apple Tansy, Gingerbread and so on, which are simple delights that you can find all over the Lakes, to special recipes from some of the Lake District's top chefs. We've also set out some for you to try, lower down this page: so if you want to make the delicious dishes you've sampled in Cumbria when you're back home, you'll have the recipe close at hand. To maintain the connection between food production and the landscape. To ensure farmers get a fair price for their produce - which they do not when they sell to the larger supermarkets (except for Waitrose and Marks and Spencer). Money flows around the local economy. Locally produced food does not incur transport costs or cause CO2 and fuel emissions. Local food is likely to be healthier as farmers and producers are more accountable. Animal welfare is better when the selling price is not a key factor in cost of production. Diversity and local production are also key features in maintaining the landscape. So, to encourage you to buy locally and eat healthy food produced in the Lake District, here is a set of links to local producers, retailers and farmers who we recommend. The Herdwick sheep is the archetypal animal of Lakeland, and its natural diet of fell grass and herbs gives it a superb tasting meat which rewards the enthusiastic cook and meat eater! It's a healthy animal, too, free of the diseases which have plagued intensively farmed animals in recent times. To support all of the farmers who breed Herdwicks, and to maintain the landscape of the Lakes as it has been for centuries, we urge you to support the Herdwick Hill Breeders Association's scheme whereby you can buy a whole or half sheep or lamb ready butchered and delivered to your door ready for the freezer. Get all the information here. You can find a list of places in Cumbria where you can buy organic meat here. From Allerdale goats' cheese through to Lakeland butter, the dairy produce of Cumbria is of special quality, though interestingly enough cow's cheese is not one of the key products of the area. One of the glorious exceptions to this trend is the range of Kendal cheeses made from milk produced on the Low Sizergh Farm, near Kendal, where around 120 dairy cows supply milk for cheesemaker Chris Sandham in Lancashire. He makes Kendal Creamy, Kendal Crumbly and Kendal Crumbly with Red Onion, all of which are on sale at Low Sizergh Farm Shop. You can find a list of other places which sell organic dairy produce on the farm here. A local supplier of organic fruit and vegetables in a box delivery scheme is a company called Eva Botanicals, based in Brampton. 1. Pre-heat oven to 170C / 325F / Gas 3. Butter a 20 cm (8 inch) sandwich tin. 2. Place the flour, bicarbonate of soda, cream of tartar and ground ginger in a bowl. Add butter and rub in until the mixture resembles fine breadcrumbs. Mix in the brown sugar. Carefully add the golden syrup and lightly stir into the mixture with a knife. 3. Spread the mixture in the tin, level and bake for 45 to 50 minutes until golden brown. 4. Remove from the oven and sprinkle with granulated sugar. Leave to cool in the tin for 15 minutes. Cut into 12 wedges and remove from the tin. Place on a wire rack and leave until cold. Store in an airtight tin until required. The origin of gingerbread lies in the rich banquets of the 17th and 18th century, where the richly spiced gingerbread was served to help prevent indigestion after the excesses of the fish and meat courses of a meal! 1. Put the washed damsons in a pan with the water and boil for about 20-30 minutes. 2. Add the sugar and boil for about 5 minutes or until the setting point is reached. 3. Pot up into warm jars. Pass the jam through a sieve towards the end of the cooking time to remove the stones. Damsons are produced in large quantities in the Lakes, and especially in the valleys around Kendal, the Lyth valley in particular. They are delicious when made into jam or wine. 1. Line a buttered pie plate with half the pastry and cover with the dates and ginger. 2. Beat the butter, sugar and rum and pour over the filling. 3. Cover with the remaining pastry and bake in a moderately hot oven for 10-15 minutes. 4. Then turn down the heat and bake for approximately 30 minutes. 5. Serve with creme fraiche. The ports of the Cumbrian coats were very active in the Rum and spice trade, which has led to the popularity of these ingredients in Cumbrian cooking. You can combine rum, dried fruit and brown sugar with Cumbrian varieties of apple (such as Forty Shilling, Carlisle Codling and Keswick Codling) to make a delicious and different Rum Nicky. 1. Peel and slice vegetables, trim fat from meat, slice black pudding. 2. Layer potatoes, onions, meat and pudding, seasoning each layer and finishing with potatoes, in a casserole dish. 3. Pour over hot stock, sprinkle with salt, cover and cook for 1 ½ hours in a moderate oven. 4. Remove lid, brush potatoes with melted dripping or butter, return to the oven for a further ½ hour, to brown, raising the heat of oven slightly if necessary. 5.Decorate with parsley and serve straight from the cooking dish, accompanied by pickled cabbage. For the Madeira braised shin, sear the beef in hot butter until well browned all over. Add the rest of the ingredients, except the carrots. Season. Place a lid or cover the pan tightly with tin foil, and oven cook at 200°C for 2½ hours, or until tender. Remove the beef, cut the strings off and strain the liquid. Add the carrots and simmer until tender then remove from the liquid to a thickish glaze. Set aside to keep warm until ready to serve. For the slow roast tomato and nettle muffin, sieve the flour, cornmeal, salt, baking powder and nutmeg together in a large bowl. Stir in the egg and milk. Fold in the chopped tomatoes and nettle. Spoon the mixture into 4 greased and lightly floured muffin tins, and bake for 12-15 minutes at 175°C. For the roast asparagus, cut the asparagus all to the same length of 10cm. Wrap the air-dried ham around the bottom and secure the ham with a cocktail stick through the asparagus. Pour the butter over and season with ground black pepper and a little salt. To serve, roast the asparagus in the oven at 200°C for 10 minutes. Slice the beef and stand on warmed plates next to the asparagus, and the muffin. Drizzle the reduced Madeira sauce around the beef and serve. 1. Stew damsons, remove stones and put purée into a greased pie dish. 2. Mix flour, baking powder and sugar and rub in the butter. 3. Mix to a dough with about 7 tablespoons milk, roll out on a floured board and cut in small rounds. 4. Place the scones overlapping each other in a ring on the purée, brush with milk and cook for about 30 minutes near the top of a fairly hot oven. Traditional Cumbrian food was suited to a population who faced a hard life on the hills, eating as economically as possible and using every part of the animal at their disposal. The most famous meat products from the Lake District are the Cumbrian sausage and the Herdwick sheep - served as either mutton or lamb. The Cumbrian sausage is traditionally spicy (that's because of the Cumbrian ports' connection with the spice trade again), and made in a long, thick coil of sausage. Good examples are made with lean pork. You can also find Cumberland hams if you look hard enough, sold unsmoked and traditionally dry-cured with salt and brown sugar. There are around a million sheep in Cumbria, and mostly the breeds are the ones noted for their hardiness and resilience. 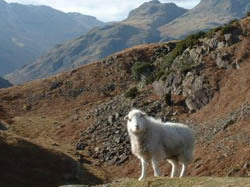 The Herdwick is the traditional upland sheep, with a homing instinct that means it stays on the fells where it was born. Another breed is the Keswick Rough Fell, though in my opinion the Herdwick has a much better flavour. Meat served as lamb will be up to a year old: mutton is older, and rewards slow, careful cooking. Whether served as a roast joint or in shepherds pie, Herdwick mutton is hard to beat for flavour. Cumbrian cattle are bred in large numbers, and their milk is used to make delicious butter, yogurt, and cheese. Cumbrian rum butter was a staple of life in days gone by; the remains of the rum butter served at a christening would have coins placed on it to ensure the newborn's prosperity and success in life. Nowadays there's an increasing move towards goats' and sheep's milk cheeses. Trout and salmon were once widespread in the Lakes, though the farming of these fish is increasingly widespread as the natural stocks diminish. Windermere has its own unique species of fish, the char, a relative of the salmon which survived and evolved in isolation in the Lakes. It was originally served potted, or in pies. You can occasionally find them on the menu at local restaurants (try Lucy's of Ambleside) when the stocks are doing well. Witherslacks (known elsewhere as damsons) and apples grow well in the Lakes. Damsons are rather acidic but cook well: for example, damson and apple tansy (which would originally have included the herb tansy) are rather good puddings (see recipe above). Kendal Mint Cake has gone across the world on mountaineering expeditions - it's a simple hard paste of sugar and mint, full of energy to sustain you on a trek in the mountains. And Grasmere gingerbread is a famous product - it's been made in Grasmere since 1855. As we've already mentioned, the rum trade was closely connected with the Cumbrian ports, and the legacy lingers on in the form of Cumbrian rum butter and even a modern brand of "Cumbrian rum". The spice trade was big locally, too, and you can find the heritage of this in the cakes which are local specialties, such as Westmorland pepper cake.